Russia is making a major push into Formula 1 racing with its first Grand Prix and a Daniil Kvyat, a new driver with serious speed and strong commercial appeal. Russia’s ubiquitous dashcams make driving in the country seem like a total adventure. YouTube is full of videos showing the daily challenges of Russian drivers – from facing off against a drunk aggressor mounted on a donkey to avoiding distraction from a meteorite blazing overhead. But now the time has come for a reappraisal of Russian drivers. No more will they be judged on crashed Ladas or vodka-addled seniors. The onboard camera will be moving at over 200 mph, because Russia is becoming a power in Formula 1. The precision-engineered “pinnacle of motorsport” is on its way to Sochi for its first Russian Grand Prix next year, and it appears there will be a local driver capable of impressing the home crowd. The new hope is Daniil Kvyat, 19, a clean-cut kid with serious speed and, as is sadly all too important in modern racing, strong commercial appeal. There has been a Russian in F1 before, the often underwhelming Vitaly Petrov, and another youngster, Sergei Sirotkin, is joining next year, but Kvyat has by far the best record. Could he be the real deal? The team Kvyat joins is Toro Rosso, who are hardly members of the sport’s elite in their own right, but as the development team for champions Red Bull, they offer a great path to the top. Toro Rosso produced Sebastian Vettel, the crushingly dominant three-time champion now on for a fourth straight title this weekend, and Kvyat’s seat for 2014 was only vacant because the man he replaces, Daniel Ricciardo, is being moved up to partner Vettel. 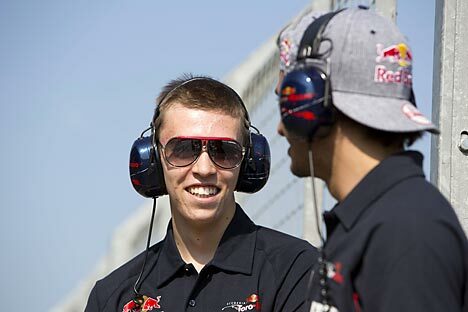 On the flipside, anything less than stellar performances at Toro Rosso could swiftly cut off Kvyat’s pathway to success. Sebastian Bourdais arrived as a four-time U.S. Champ Car champion in 2008, but 18 months later he was gone, his reputation in tatters. While most other F1 teams demand that drivers bring wads of sponsor cash with them, the Red Bull drinks company provides lavish funding for the team, which creates something of a meritocracy, albeit a ruthless one. That’s not to say Kvyat’s nationality isn’t a major plus. Russia’s big F1 coming-out party is scheduled for next October in the Olympic host city of Sochi, when Kvyat, Sirotkin and a (possibly) returning Petrov will be on the grid, as will the struggling Russian-owned team Marussia, one of the sport’s also-rans. Before that, Kvyat will also have raced at the series’ new American set-piece, a race on the streets of West New York in June, with the Manhattan skyline in the background. Russia’s new races and drivers are part of a drift for F1 away from its traditional Western European base into new markets. For Bernie Ecclestone, the octogenarian who controls the sport in a similar manner to the commissioners of North American sports leagues, there is obvious appeal in new frontiers, not least governments lining up to pay as much as $20 million a year to host a race. With that in mind, 2014 could be Russia’s year on the track, as a combination of economic power and driving skill combine - and not a dashcam in sight.